By Dale Johnson Posted: January 9, 2018 6:00 a.m.
Driverless farm equipment is becoming more and more attractive to today’s farmers as they battle short growing seasons and rising fuel and equipment costs. 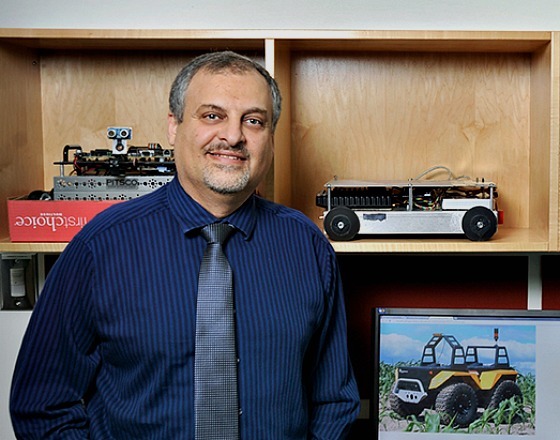 Dr. Mehran Mehrandezh has his eye on improving crop yields through the use of automation and algorithms, focussing his efforts on making the entire tillage process more precise. Mehrandezh, a Professor of Industrial Systems Engineering in the Faculty of Engineering and Applied Science, says faster and more precise farming can also reduce the carbon footprint of the farming machinery by consuming less fuel. He and his research team are developing sensors that can be mounted on farm implements. He says this new form of Artificial Neural Networks is a physical replication of how the brain works, and how it learns how to learn. “If trained well, the machine-learning algorithm may be able to outperform humans in terms of the speed of detection, and accuracy. Furthermore, the sensors used for monitoring the process, namely cameras, can zoom in on the features of the landscape, something that homo sapiens lack,” Mehrandezh explains. He says these sensors will observe if the machine is producing the desired results; detect malfunctions due to the breakage of a shank; and spot areas where tillage is undesirable. His research team has received funding from the Natural Science and Engineering Research Council of Canada to work with the Salford Group, an agricultural equipment firm, on adding autonomy to tillage applications for testing. Mehrandezh’s latest research follows work with automated seeding in 2016. That’s when he led a team of students at the AgBOT Challenge held in Indiana. The student teams had to come up with the most efficient unmanned crop seeder capable of planting two varieties of seed over half-mile-long rows, while providing real-time data utilizing a mobile tracking antenna. The team came home with the first prize of $50,000. Mehrandezh says that experience led to his current research.